A native of Stockholm, Tegmark left Sweden in 1990 after receiving his B.Sc. in Physics from the Royal Institute of Technology (he’d earned a B.A. in Economics the previous year at the Stockholm School of Economics). His first academic venture beyond Scandinavia brought him to California, where he studied physics at the University of California, Berkeley, earning his M.A. in 1992, and Ph.D. in 1994. After four years of west coast living, Tegmark returned to Europe and accepted an appointment as a research associate with the Max-Planck-Institut für Physik in Munich. In 1996 he headed back to the U.S. as a Hubble Fellow and member of the Institute for Advanced Study, Princeton. 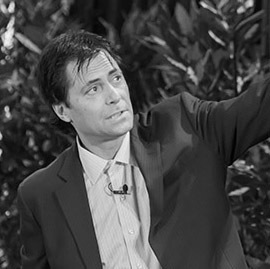 Tegmark remained in New Jersey for a few years until an opportunity arrived to experience the urban northeast with an Assistant Professorship at the University of Pennsylvania, where he received tenure in 2003. He extended the east coast experiment and moved north of Philly to the shores of the Charles River (Cambridge-side), arriving at MIT in September 2004. He is married to Meia-Chita Tegmark and has two sons, Philip and Alexander. Tegmark is an author on more than two hundred technical papers, and has featured in dozens of science documentaries. He has received numerous awards for his research, including a Packard Fellowship (2001-06), Cottrell Scholar Award (2002-07), and an NSF Career grant (2002-07), and is a Fellow of the American Physical Society. His work with the SDSS collaboration on galaxy clustering shared the first prize in Science magazine’s "Breakthrough of the Year: 2003."